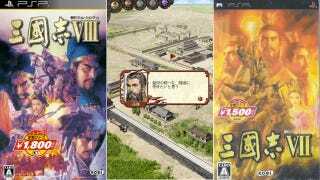 Okay, it's only July, but this is going to be hard to beat: Koei put out the wrong game in its latest PSP release. Doh! The budget version of tactical role-playing game Sangokushi VIII that was released on July 12 did not contain Sangokushi VIII on the UMD. Instead, it contained Sangokushi VII. Koei stopped sales of the game and is working on a replacement program for those who already picked up the title. If you thought that the Sangokushi series was starting to blur and look the same, this mistake shows you are not alone.